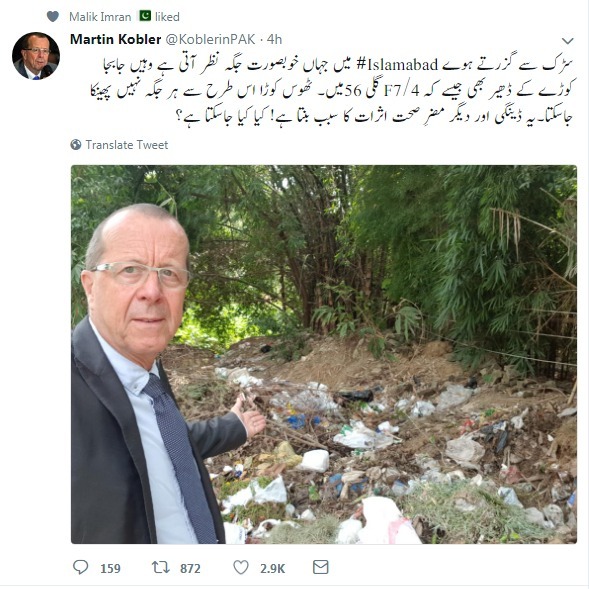 The Capital Development Authority (CDA) suspended on Tuesday its two officials after the German Ambassador to Pakistan Martin Kobler tweeted a picture of garbage in the federal capital. Director Sanitation sprung into action and suspended the supervisor and inspector after the tweet by Kobler, who has grown popular on Pakistani twitter sphere due to his mostly positive tweets about the country’s culture and people. “Saw beautiful scenery while passing through roads on Islamabad but also saw heaps of garbage at various places, like in F7/4 Street 56,” he tweeted in Urdu and English. Kobler frequently tweets about his love of the food and culture of Pakistan. Earlier, Kobler won the hearts of countrymen by mingling with locals, visiting ordinary food shops and traveling by train, shared his experience, inviting praises from Pakistanis.